There aren’t too many business that you get to assist in making one of the most important days of a child’s life special. Here’s what it’ll take to make that happen. Our franchisees and their staff treat everyday like it’s a party and the most important one is the next…because it is! As a Pump It Up franchisee, one of the top qualities you must have is an absolute passion to help kids unleash their inner party animals. More than 80% of our business comes from people who have attended a Pump It Up party for another child and want the same experience for their kids. Our customers entrust us with the biggest day of their child’s year expect us to make them feel special for their birthday. We expect our franchisees to make sure that happens each and every time. Have you ever wanted to leave work early to attend your son’s soccer game or your daughter’s ballet recital without worrying about what your boss might think? You are among the many parents who worry about their employment each and every day because of their second shift at home. Trying to the right work-life balance is next to impossible unless you are the one calling the shots. Pump It Up can help achieve that balance in your life without having to sacrifice family or business. It also means freedom and the ability to prioritize your life and schedule accordingly. There are times when family needs to come first and there are times when your business needs attention. We understand because we’re there too. Just like the customers we serve, our franchisees come from wonderfully diverse backgrounds and walks of life. While they’re all diverse in their own way, our owners do share one thing in common, they all have the same entrepreneurial spirit. Pump It Up is proud to have been named “Best Franchise for Minorities” on numerous occasions and we are a proud member of Vet Fran. Our franchisees are passionate about the communities they operate their stores in. They realize that being a part of their community is not just good for business, but it is the right thing to do. Our stores participate in school fundraisers, help raise awareness for local causes and offer a place where kids can interact and socialize in the safety of a trusted local business. Our customer experience is paramount to everything we do. As a Pump It Up owner you’re entrusted with carrying on our legacy of providing the best, most exciting, hassle-free and safest experience for the birthday kid and their friends. The level of service we provide is one of the major reasons we stand out in a crowded kids birthday party market. Pump It Up’s nationally recognized insurance carrier completed an independent audit of our open facilities and awarded Pump It Up an A+ rating with a total scoring average of 99 out of 100 per facility. We have over 15 years of safety experience that has been instilled in all of our franchisees to ensure the safest facilities. We integrate safety into each step taken both before and after a facility opens. Your job as a Pump It Up franchisee will be to ensure our excellent safety reputation is maintained. Our unique 5-point safety program will help you and your staff make sure your guests are enjoying their time at Pump It Up in the most safe (and fun) way possible! Just like a theme park, it is important to always offer new and exciting events and attractions at your store. Being the best means staying one step ahead of the competition and Pump It Up helps by always looking for new and exciting rides, attractions and overall innovation. Making sure your guests are well taken care of and leave happy is key to ensuring they come back time and time again. But how do you make that happen? Don’t worry, you won’t have to reinvent the wheel or even the kids birthday party. 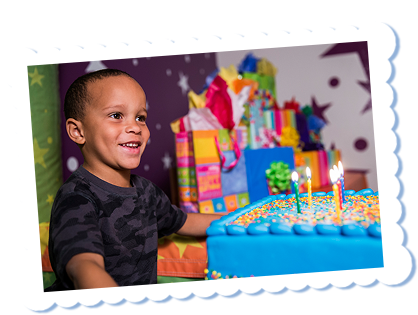 Our easy to follow customer service program is designed to make sure every birthday child feels extra special. The best owners are the ones focused on how to make their business better. While you’re doing that, let us help take the stress out of marketing said business. When you purchase a Pump It Up franchise, you get more than just the name. You get a support system. Our internal tools have been designed with your needs in mind for website management, email marketing, digital marketing, social media creative and more. You also get a network of other franchise owners to tap into for support, best practices and continual learning. You know your community and business needs more than we do. Unlike most other franchise concepts, we allow franchisees to customize their website to showcase local offerings and prices. We don’t simply leave you on your own though. We are there to constantly monitor, test and optimize your website so your site to ensure it delivers the level of customer service you do in stores and improve profitability for you. As customers change, so does the method in which a business owner must communicate with them. Gone are the days of a newspaper or magazine ads to attract customers to your store. The complex and ever-changing world of digital marketing is how you need to engage today’s busy families. Pump It Up provides strategies, tools and resources to help you manage your business effectively and efficiently. You don’t have to be a digital marketing expert or hire consultants to market your business. We’re looking for party pros with with gregarious personalities and a desire to deliver an experience that makes kids faces light up every time. The type of person ideal for the job is someone who likes to perform and have a good eye for details. Your staff needs to know that taking their job seriously is all about having fun. That’s why we require our franchisees to have a passion for every party every day. As an owner of a Pump It Up franchise, you must hire staff that share that same commitment. To say there is a “typical” Pump It Up Party Pro is to do a disservice to those who work in store. The common thread is people passionate about making a kid’s biggest day truly special and have a smile while doing it. At Pump It Up we like to promote from within, so our staff sometimes like to “move up” to the front desk and help moms and dads plan their child’s extra special party. We also have stay at home moms at our front desk who are looking for some weekday part-time work while the kids are in school. No matter what position you may be hiring for, there are some traits you just can’t train. Finding candidates with out-going personalities who like to entertain and interact with kids and their families can be a daunting task. Pump It Up’s unique interviewing process helps franchisees gain better insight to a potential staff member compared to traditional one-on-one interviews to help you find just the right staff. Private birthday parties will always be our core business and strength, but every great brand must evolve. As new technologies and competitors enter the marketplace, Pump It Up intends to maintain our presence as a leader in children’s entertainment and meet the needs of our consumers. Since 2009 we have strived to enhance our non-birthday party business to help our franchisees bottom line. Our most successful franchisees never take their eyes off the birthday business but they also work hard to ensure there are plenty of activities to ensure everyday’s a party. 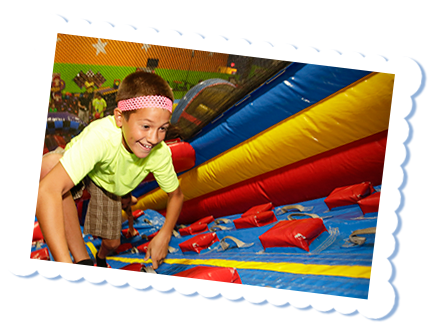 Field trips, day camps, special events, fundraisers and business-to-business partnerships are just some of the ideas Pump It Up and its franchisees have developed over the years to ensure our brand stays an industry leader. Pump It Up and our sister brand BounceU work constantly with vendors to ensure our franchisees have quality products at reasonable prices. From a 20-foot inflatable slide to a small toy for a goodie bag, we use our combined buying power to ensure you have the items you need when you need them and at the right price. Unlike most franchises, we have a limited amount of “required vendors.” In many cases, if our franchisees can find a quality product the meets our standards for a cheaper price, we allow you to use you own vendor. Unique to most franchise concepts, our Mission Control Support Team is here to support our franchisees during all store business hours, 7 days a week. No question is too small or too big for our experienced team to handle. From a simple question to the most complex business analysis, as a Pump It Up franchisee, you will have at your disposal a team of experienced experts providing unique perspectives on every facet of the business. Whether it’s operations, customer service, financials, training, or marketing, our support team is in tune with the current trends across the country.